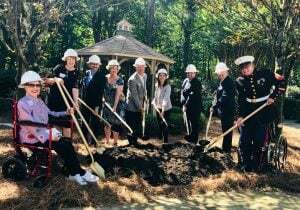 A multitude of community stakeholders gathered enthusiastically in the garden courtyard of Peachtree Christian Health(PCH) on Monday to celebrate the official groundbreaking of their new construction phase. PCH’s current 18,412 sq. ft. facility, will undergo various stages of upgrades including new construction and expansion, renovation and cosmetic improvements. The events of the morning included hard hats and gold shovels, a reveal of the new renderings and floor plans, introduction of development team members, guided tours, information on naming opportunities (ranging from $10-250K), a collaborative art project and lunch. The new construction phase will bring online an additional 6,046 square feet to the building footprint that will provide for beautiful new community and activity rooms that tie the two outside wings together. 7,578 sq. ft. of the existing space will go through a renovation and repurposing, with the remaining, 10,834 sq. ft. receiving a light cosmetic facelift. The facility’s beautiful chapel, that has been a treasured spiritual refuge for so many through the years, will remain in tact as a main feature of the facility. 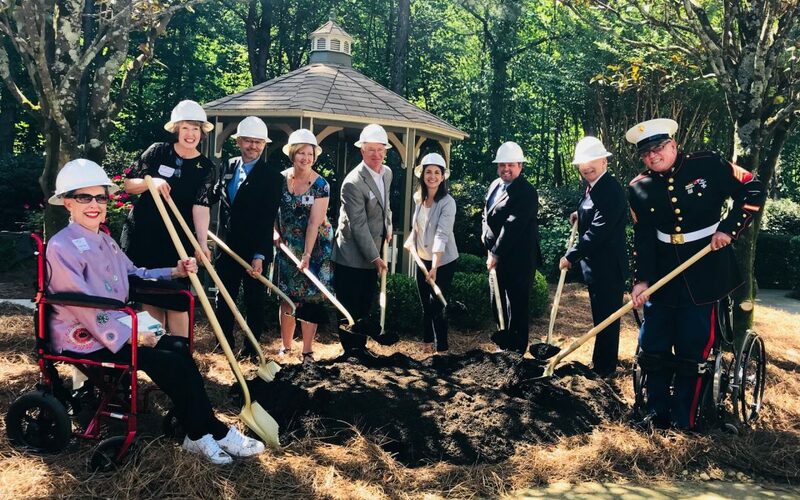 When all phases are complete in spring of 2019, Peachtree Christian Health will reopen as a Life Enrichment Center focused on providing adult day services for families caring for disabled and aging adults across the community. In December 2017 Peachtree Christian Hospice announced the closing of their hospice services due to the changing landscape of healthcare and decreased need for in-patient hospice care. In January 2018 they re-emerged as Peachtree Christian Health (PCH) with a new mission to address a rapidly growing need in the community for adult day and respite care services for families caring for aging and disabled adults. The existing PCH facility proved to be the perfect footprint for a new life enrichment center. PCH’s new adult day services will focus on keeping families together. They will serve adults of all ages who need clinical care, oversight, and support. Their program will be designed to enrich the lives of all participants, their caregivers, and their families. The goal is to help everyone thrive through all of life’s challenges and circumstances. With the ceremonial groundbreaking complete and funding in place, the $3 million construction phase will soon kick into high gear. The general contractor will be selected by mid May and the construction is expected to begin shortly thereafter. Architectural designs have been submitted for approval by the city and a parking variance has been approved. Construction is expected to be complete by early 2019. Once the CO is achieved PCH can apply for their state license. The goal is to open the doors to the new facility in spring of 2019.